Where do I use my Laura Ashley voucher code? Select the code you would like to use, then follow our link to the Laura Ashley website. Shop as normal and add your items to your basket. When you’re ready to checkout click the shopping bag link at the top of the page. Enter your Laura Ashley voucher code in the box underneath the order summary and click ‘Add’. Your discount will be automatically applied to your order total. Click ‘Checkout Securely’ to sign up or log into your account and enter your payment details. For decades, Laura Ashley has strived to deliver the latest in stylish, affordable fashion for women. With their expensive and inexpensive seasonal collections and constant commitment to quality, Laura Ashley has been helping customers add that special something to their wardrobes for over 50 years! Choose from their exciting ranges of clothing for women and girls, you’re sure to find something you will love. Make sure to check here first for all the latest discounts! 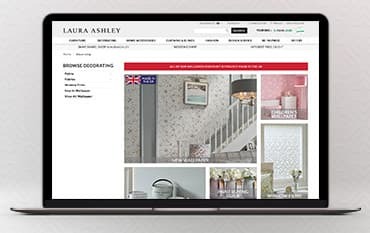 The home furnishings and furniture department at Laura Ashley boast excellence, featuring wallpaper, curtains, fabric, lighting, bedding, decorative accessories and so much more! With home delivery available as well as a 28 days return policy, you can be rest assured of your purchases meeting your satisfaction from the moment you click the order button. As the season changes, your home deserves a well-needed touch-up and if that’s the case then why not consider giving your walls luxury treatment with Laura Ashley Wallpaper! If you’re in search for that contemporary feel in your home, then look no further than the Laura Ashley collection, where you’re bound to find something perfect for your home and decor. There is a price range to suit everyone so you might not spend as much as you anticipated! When it comes to home renovation, the latest styles are shifting all the time and when a lick of paint used to be the people’s choice, it’s now all about the statement wallpaper. Wallpaper can add a much more personal feel to your home and at Laura Ashley, there is an extensive range to choose from. Featuring soft, dual-colour florals, stripes, animal prints, patterned & plain, whatever your preference, you will find something to suit your home. Check out the collection today and see how much money you could save with one of our offers or discount codes. Whether your home is large and spacious, or small and compact, at Laura Ashley, discover luxury furnishings perfect for every home, whatever size and whatever your decor. Whichever room you choose to give some TLC, then you will find exactly what you’re looking for from statement coffee tables, luxurious upholstery, Beds & Mattresses, Sofas & Armchairs, Dining tables, Drawers, storage units and so much more! The right piece of furniture can add so much character, especially when teamed up with the perfect complimentary accessory! Browse all types of furnishings at Laura Ashley, whatever your preferred style is and be sure to use on of our latest deals or voucher codes! There is no quicker or easier way to update your bedroom than with a change of bedding! With the wide selection of bed sets, duvet covers, pillowcases, sheets & blankets at Laura Ashley, you will find everything you need to create your dream bedroom at a price you can afford. Give your bedroom the uplift it deserves; with fresh bedding, you can create a whole new look in a matter of minutes! Explore the range today and find a selection of contemporary styles, floral's, patterned & kids. Lighting is the ideal way to create atmosphere in your home and with the wide selection at available at Laura Ashley you’re guaranteed to find the right price for any room. From ceiling lights and Chandeliers, lamp shades, table lamps, accessories, kids lighting and so much more, you can add some shine to your home in no time. Find something you love at an even better price! Browse our latest lighting deals & discounts for extras savings. Standard Home Furnishings & Made to Measure Curtains & Blind: £4.50 delivery. Made to Order Furniture & Cabinet: £25 delivery charge. How can I contact Laura Ashley with a query? To contact Laura Ashley call 03332 008 009. If you would like to amend your personal details please contact Laura Ashley. As a leading retailer in the Furnishing and Fashion industry, Laura Ashley is a popular brand combining luxury and affordability! Make sure you make the most of our discount & vouchercodes right here and you could make great savings on your next purchase. With a huge range of stock featuring bespoke design services, unique furniture, fashion collections and so much more!Whether you’re re-decorating your home or just fancy a browse, check Laura Ashley out today and don’t forget to add one of our discount codes for extra savings. We are constantly on the hunt for first order Voucher Codes for Laura Ashley to help you with your money saving. Our experts check dozens of sites for secret codes including NHS discounts, student sites & social media channels saving you time & money!